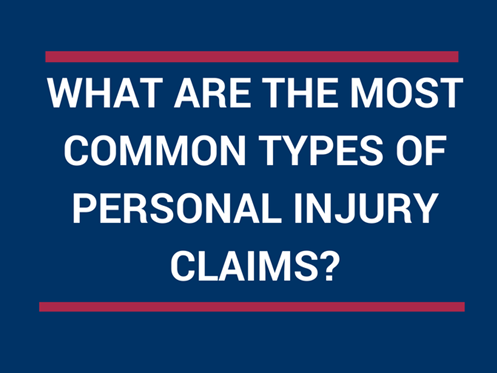 Answer: Without question, the most common types of personal injury cases result from motor vehicle accidents. With millions of cars on the road each day in the United States alone, there are thousands of motor vehicle accidents. These accidents range from the harmless fender bender two accident that caused serious injuries and or fatalities. The next most common types of personal-injury claims is a "premises liability" claim. Please include slip and falls, trips and falls and or any type of incident-causing injury that occurs on another's property. Contrary to myth, a property owner or possessor is not automatically liable when somebody gets injured on their property. Just like a motor vehicle accident, you have to prove that somebody did something wrong which resulted in the injury. Not sure if you have a case? Seek the advice and counsel of an experienced personal injury lawyer. Look for one who is a certified specialist in injury cases; he/she will have the greatest amount of knowledge and experience to best advise you in your case, and to get you the result the law says you deserve.